A Bird in the Hand's blog has given us an idea on how to upcycle our bottle caps into something wonderful. 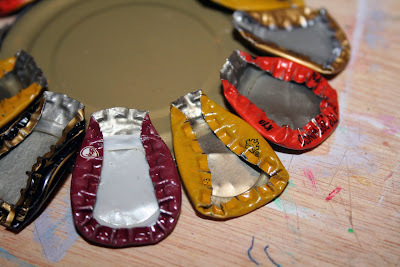 We have been looking for a way to upcycle our bottle caps and this may be just the thing. Be sure to check out their blog for more fun DIY! Now, here's a step-by-step tutorial. First I collected my materials. 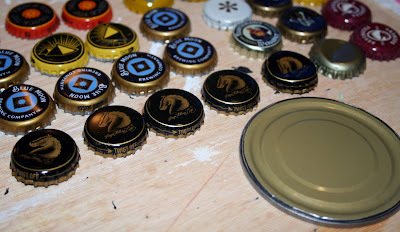 I used bottle caps (I used 20 in mine), a tin can lid, a chopstick, and glue (I started with super glue but switched to epoxy b/c some weren't holding). From there, I started bending my bottle caps into the shape of flower petals. 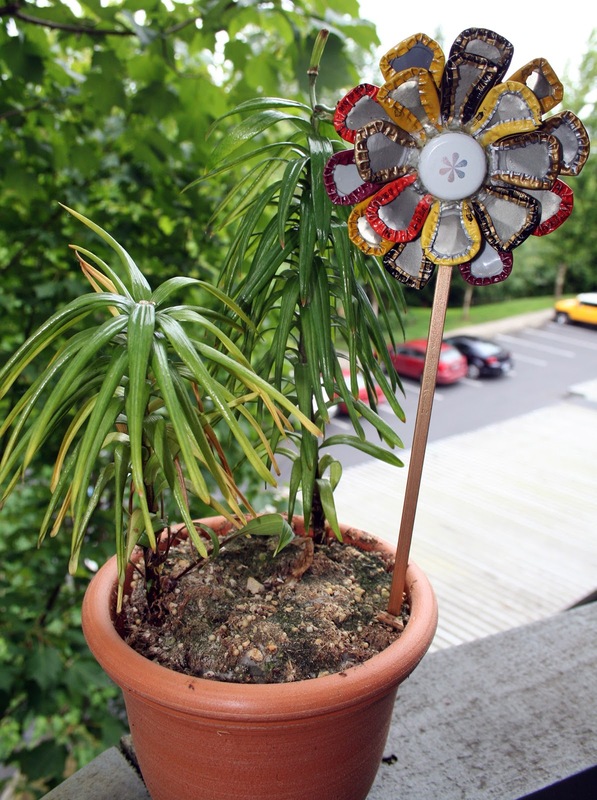 The basic idea was inspired by a previous Iron Craft project where I had created a felt flower. I used my pliers and just started bending until I got the shape I wanted. 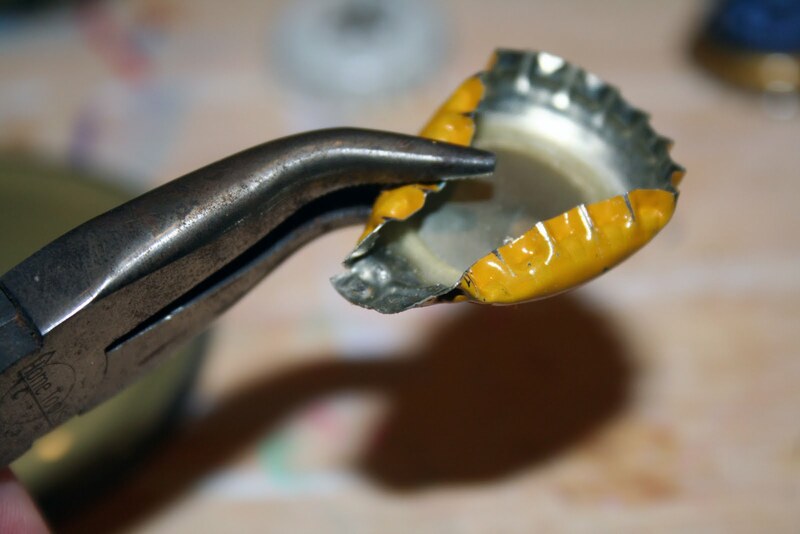 For me, the easiest way to do it was to grab the rim of the bottle cap and pull it down to flatten it. Then I would bend in the two sides. Finally, I would bend down the top. My first few petals looked like blobs of metal so it takes a little trial-and-error. As I went, I laid my petals out on the tin can lid to determine how many I would need. I did two layers of petals, but you can switch it up and do more if you like. 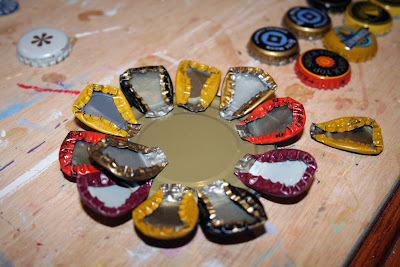 Next I glued on the petals. I did the entire outside row first and then switched to the second layer. Like I mentioned above, I tried using super glue but found that some of my petals weren't holding so I switched to epoxy. Finally, I added one more bottle cap in the center. Now you have a finished flower! 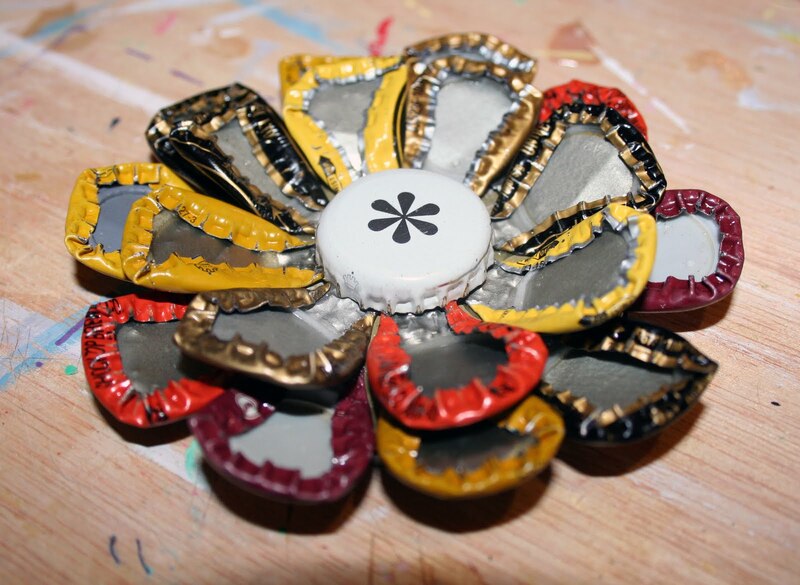 From there, I attached a chopstick by gluing it onto the can lid in between two of the petals. This allowed me to turn it into a garden stake. But there are lots of other possibilities. You could paint it, add leaves (maybe cut from soda cans? 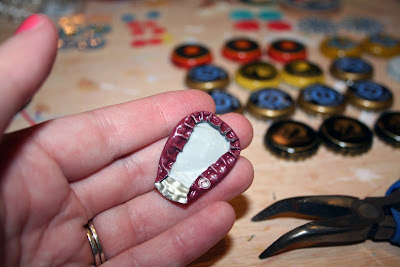 ), turn it into a pin, etc.